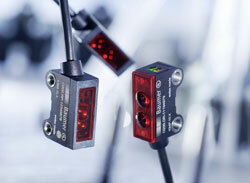 Baumer: The new O200 sensors from Baumer considerably raise the performance bar for optical miniature sensors. Economical in operation and featuring an impressive function variety in a standardized miniature housing, these sensors reflect the typical Baumer plus in performance with strong features like “High-Power-Mode” and high immunity to ambient light - true to the motto: «Beyond the Standard». - O200 sensors ignore ambient light by machine reflections or other sensors, even bright LEDs emitting a similar spectrum of light and operating on similar switching frequencies. With conventional sensors, such disturbances result in the object not being detected or sensor operation being slowed down. Baumer sensors are different: the ingenious interaction of optical precision, powerful electronics and the best algorithms ensure consistently high detection reliability, under any light condition or on glossy or transparent object surfaces. - O200 sensors feature high-power mode to reliably detect ultra-black, light-absorbing objects even at long distance. Product variants with V-optics specialize in glossy or transparent objects. And the SmartReflect sensors eliminate the need for an external reflector. - O200 sensors with IO-Link are ready for Industry 4.0 and IIoT. The latest IO-Link standard allows the sensors to be configured automatically. Furthermore, the sensors deliver additional information such as operating hours or switch-on cycles and other data for optimized process performance. The qTeach feature enables on-site configuration straight at the sensor with protection against unauthorized access. - O200 are the first sensors with light beam embedded CAD data - a market innovation and significant engineering improvement. Presently, the O200 series comprises around 130 variants with different properties and combinations. "This variety offers every user the right optical sensor and best application match, with extra performance in terms of «Beyond the Standard», promises Andrea Memminger-Wäsch, Senior Marketing Manager at Baumer.